EXECUTIVE COMMITTEE Mike McManus, President Memorial Regional Health Services, Inc.
Memorial Regional Health Services, Inc.
Edmond Brown, President Elect ELB Enterprises, Inc.
Ameren Belleville News-Democrat Greensfelder, Hemker & Gale, P.C. Ads must be received by the 15th of each month, electronically in JPEG or PDF form. Please call 618-233-2015 or email marketing@bellevillechamber.org to reserve your ad space. Find a brief synopsis of this year’s honorees on the next page. CONTINUED COVER STORY RALPH GOLDSTICKER He was born in October 1921 and enlisted in U.S. Army Aviation Cadet Corps on July 6, 1942. He became a bombardier on a B-17. On June 6, 1944, during the D-Day invasion, Goldsticker’s aircraft flew two missions totaling 14 hours in the air. He was released from active service on October 20, 1945, after his 35th mission. JIM REYNOLDS Born in November 1922, Reynolds got into flying after a small plane landed on his father’s farm where he got a free ride and fell in love with flying at a young age. Reynolds ultimately became a pilot, and was qualified to fly 22 different aircraft. Reynolds flew numerous VIP missions, including for the vice president of the (Back row, left to right) Belleville Mayor Mark Eckert, Belle-Scott United States, secretary of the Army, Civilian Chair Geri Boyer, Committee Member Terry Foerste secretary of the Air Force, director of the (Front row, left to right) Honored veterans Fred Bruss, Jim Reynolds CIA, and retired Gen. Jimmy Doolittle. & Ralph Goldsticker Overall, Reynolds ended his career with 9,700 military flight hours and 800 additional civilian hours. Before he retired from the Air Force in 1965, Reynolds was commander of the 375th Air Medical Squadron at Scott Air Force Base. FRED BRUSS Bruss was born in 1924 and is a Belleville native. At the age of 17, Bruss dropped out of high school the day after the Pearl Harbor attack to join the military service. Being too young, he was sent home but later drafted in 1942. Bruss was a gunner on an A-20 light attack bomber. Foerste explained that aircraft had one pilot and two gunners, and was used mostly for low altitude missions (200-300 ft above the ground). Bruss flew missions from April 1944 to January 1945. Bruss had to bail out once when his aircraft was damaged by anti-aircraft fire, and, on two more occasions, the aircraft sustained damage that required the aircraft to make a wheels-up belly crash landing behind Allied lines. Bruss was sent home March 25, 1945, after his 60th mission. Bruss later retired as the Belleville Fire Department’s fire chief. MORE ABOUT THE BELLE-SCOTT COMMITTEE Although today the Enlisted Dinner is the most visible public activity undertaken by the Belle-Scott Committee, much has been accomplished behind the scenes by this group since its inception. The work of the Belle-Scott Committee continues with new ideas and new programs added to those already in place. These programs and the Belle-Scott Enlisted Dinner provide an opportunity for the citizens of Belleville to show their support and appreciation for the men and women of Scott Air Force Base throughout the year. To find out more about this committee, contact the Greater Belleville Chamber of Commerce at 618-233-2015. The Commitment to Community Award is presented quarterly to a Chamber Member who demonstrates a commitment to improving the quality of life for residents and/or businesses in the greater Belleville area. The Ambassadors are honored to present this quarterâ&#x20AC;&#x2122;s award to Rose Marie Fitzgerald. Rose Marie is born and raised in the Belleville area. She currently lives in Millstadt and is truly a gem in this community. Rose Marie retired from Commerce Bank where she worked with their (left to right) Ambassador Chairman Terri Dambacher, Chamber Senior Partners, planning group trips Executive Director Wendy Pfeil, Rose Marie Fitzgerald, Belleville ranging from day trips around the Mayor Mark Eckert area to cruises and more. She has great attention to detail and it showed in her work. Rose Marie was great at what she did and brought joy to those she interacted with. Rose Marie is also a wonderful community member by giving back through her volunteer work. She has volunteered with organizations including MindsEye radio station, reading to those who cannot see. She has also been an avid supporter of the Greater Belleville Chamber of Commerce, serving as an ambassador for many years and volunteering for multiple events. The Greater Belleville Chamber of Commerce and our Ambassadors are proud to honor Rose Marie Fitzgerald with this quarterâ&#x20AC;&#x2122;s Commitment to Community Award. Advertise your organization’s job opportunities for free! E-mail your job descriptions to marketing@bellevillechamber.org or call 618-233-2015 for more information. If you’re interested in getting involved with a committee, please call the Chamber at 618-233-2015. Suggested Items: Tooth brushes, Tooth paste, Shampoo, Body Wash, Bar Soap, Kleenex, Deodorant, Lotion, Wipes, Lip Balm, etc. Items must fit in a quart sized plastic bag. to the following businesses and organizations who joined the Chamber in February. to the following members for renewing their membership with the Chamber in February. Celebrating a new business opening, anniversary or remodel? Celebrate with a Ribbon Cutting! Contact Peggy Schifferdecker, Membership/Event Manager, for more info. Call the Chamber Office at (618) 233-2015. Upcoming Business After Hours April 4 St. Paulâ&#x20AC;&#x2122;s Senior Community RSVP for events online at www.BellevilleChamber.org! Just click on the event you wish to attend and log-in. Need help? Email your RSVP to marketing@bellevillechamber.org or call 618-233-2015.
BUSINESS AFTER HOURS On March 1, Memorial Hospital welcomed Business After Hours attendees in their auditorium for a festive event! Memorial hosted nearly 80 Chamber members and guests with Mardi Gras theme food complete with King Cake bites and masks. Memorial Hospital Belleville is conveniently located on the west side of Belleville at 4500 Memorial Drive. They also have diagnostic centers in Oâ&#x20AC;&#x2122;Fallon, Illinois, and an off-campus physical therapy center in east Belleville as well as Memorial East. In 2018, Memorial was named a Five-Star Recipient by Healthgrades for Treatment of Heart Failure, Stoke, COPD, Stomach Surgeries, GI Bleed, Sepsis, Pulmonary Embolism, and Respiratory Failure. They were also ranked by Healthgrades in the Top 10% in the Nation for Overall GI Services and Top 5% in the Nation for Patient Safety. This past year, the Washington University School of Medicine completed their big transition, combining the Cancer Treatment Center and Illinois Oncology Ltd. in Swansea and turning them into a satellite location of Siteman Cancer Center. The center is expected to move into a new building on the Memorial Hospital East campus in early 2020. At both places, the idea is to keep Illinois residents from having to drive across the Mississippi River to see Siteman doctors and participate in their renowned clinical trials. Memorial Hospital Belleville provides full- and part-time employment for more than 2,300 people. They have a medical staff with more than 400 members representing 42 specialties. Thank you to Memorial Hospital for their hospitality at the March Business After Hours. Althoff Catholic Students Learn About the Power of Presence in Peru Saint Pope John Paul II once said: “Dear young people, let yourselves be taken over by the light of Christ, and spread that light wherever you are.” Althoff Catholic High School’s annual senior service project is a three-week immersion experience that gives students the opportunity to put their faith in action through service to others. More often than not, the experience is transformative and life-changing for our Crusaders. Serving in Lima was a life-changing experience for all three girls. “I learned that I should be a more grateful person,” said Samantha. “We tend to let our problems be a wall in our lives. The people we met did not allow their problems to stop them from being happy; they showed us that a positive attitude is key to a better life.” Megan would like to continue volunteering in her community either at food pantries or clinics for people who do not have much. One of Laney’s biggest take-a-ways from the experience was not to take things like easy access to clean water, being able to Megan Hinds, Samantha Land and Laney Martz go to school every day and even having a change of chose to serve in Lima, Peru. Samantha’s mother grew clothes for granted. up in Peru and presented the girls with the option of doing their service project there. “I thought it was a great idea and jumped at the opportunity,” said “One thing I realized in Peru was that we do not hug Laney. “It seemed like a great way to do something enough in the United States,” said Laney. “The people out of my comfort zone and to experience a culture we met would greet us with a hug and a kiss on the different from my own.” cheek. It was a simple thing, but people were always kind and went out of their way to introduce themselves.” Throughout their days in Lima, the girls had the opportunity to serve at a variety of places including a pediatric cancer hospital, a school for special needs In our fast-paced, technology driven world, the power children, an animal shelter and a church. “Some of of truly being present to those around us is often lost. the kids we met were at the hospital by themselves. Saint Teresa of Calcutta said: “Go out into the world Their parents were either at work or never there at all,” today and love the people you meet. Let your pressaid Megan. “This made me sad because the children ence light new light in the hearts of people.” We are were not only sick but lonely. I am glad we got to confident that Megan, Laney and Samantha learned keep them company.” the value of giving and receiving the simple, yet powerful gift of being truly present with others while in Lima. The girls also had the opportunity to learn about the power individuals have to make a difference in the lives of others. “We met a family that turned their own In the months leading up to their trip, the girls raised home into a dog shelter,” said Laney. “Seeing how funds through GoFundMe. They also organized a one family can be so generous to all the stray animals supply drive for items such as gently used soccer in Lima was awesome.” cleats and baby clothes. Upon arriving in Peru, the girls used the funds they raised to purchase soap, snacks, coloring books, toys and puzzles for distribution Megan’s favorite experience was visiting a boy’s at the school and hospital. The girls are thankful to all orphanage. Having the opportunity to interact with who assisted them in their efforts including the grade the boys through games, songs and more was very school students at Our Lady Queen of Peace and St. meaningful. The boys even asked our Althoff Catholic Joseph’s schools. students to teach them a little English. Join us for a personal tour of Althoff Catholic to learn more about the ways in which we integrate faith and service to others into our college preparatory curriculum. Contact our Office of Admissions at 618.235.1100 ext. 116. LEADERSHIP BELLEVILLE Business Day The 2019 Leadership Belleville class participated in Business Day on March 15. The goal of the day was to witness firsthand how different businesses operate from all sizes and customer focus. They learned who influenced these leaders, how they inspire their employees, challenges they have faced on their leadership journey and how they have overcome them. Their day started with breakfast at Eckert’s and presentation by Chris Eckert and took part in Performance Enhancement Panels with Vertical Performance. Once they were finished, they traveled to Chelar Tool & Die where they took part in a leadership discussion and took a tour of the facility. They then continued their morning visiting Egyptian Workspace Partners where they met with and had discussions with leaders from there and Belleville Main Street. The group then finished their morning at 4204 Tap House with a tour and lunch. The afternoon continued to be busy with a panel discussion including Geri Boyer (Kaskaskia Engineering Group), Jennaver Brown (Eye on Design), Todd & Julia Kennedy (4204 Main Street Brewing Co.), Kevin Pesko (Bank of Belleville), Andria Powell (Circa Boutique), and Roger Wigginton (Don Rogers, Ltd.). The afternoon finished with a tour at The EDGE. A special thanks goes out to all of our speakers as well as our day coordinators, Eric Schauster (Class of 2000) and Sherry Favre-Salvatore (Class of 2018). We would also like to thank our Business Day Food Sponsors: Eckert’s & Bank of Belleville. 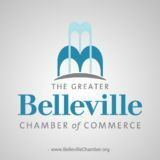 To learn more about the Leadership Belleville Program, visit www.bellevillechamber.org. GINA POOLE Gina was selected by her senior leaders at Memorial Hospital to attend the Leadership Belleville program and was excited for the opportunity to meet and collaborate with other leaders within the community and across a variety of businesses. The Leadership Belleville program has allowed for her personal leadership to grow and expand exponentially in a small, dedicated time frame. The Vertical Performance team allowed for the leaders in the class to build a safe culture to share and learn from shared experiences to enhance personal and professional growth. Gina’s expectations for the future would be to gain additional insight into her community, to increase her connection to the community, and services offered and needed to support Belleville. As well as utilize the growth in skills from the Leadership program to enrich her professional leadership career in supply chain. MEMBER EASTER EVENTS Be sure to visit our Chamber members during your Easter festivities! Easter Cookie Decorating Class Saturday, April 13 9 - 11AM Toots’ Cake & Candy Supplies, 314 E. Main St, Belleville Decorating cookies is a great way to celebrate the Easter season! You’ll learn the “secrets” of piping & flooding, along with tips to make the decorating process a snap. Register at sugardoodles.org/classes or by calling Toots, 618-277-7373. Cost: $35 2019 Easter EGG-Stravaganza Saturday, April 13 10:00 AM Bellevue Park, 401 Bellevue Park Dr., Belleville, IL 62226 This annual, FREE Easter Egg Hunt is open to the public for children ages 1-7, and is co-sponsored by the Turkey Hill Grange. Bring your own Easter basket. Arrive at 9:45 AM. Pre-registration required. Call (618) 233-1416 for details. Cost: Free St. Clair Village Apts. Annual Easter Egg Hunt April 13th 10am-1pm St. Clair Village Apartments, 409 Carlyle East, Belleville, IL 62221 Join us Saturday, April 13th for our Annual Easter Egg Hunt located at our Gazebo Park. Prizes and games for the kids. Special guest appearance and we won’t say who... can you guess? This event is open to the public. We can’t wait to see you there. Cost: Free Easter Cookie Decorating Class Thursday, April 18 6pm to 8pm Toots’ Cake & Candy Supplies, 314 E. Main St, Belleville Decorating cookies is a great way to celebrate the Easter season! You’ll learn the “secrets” of piping & flooding, along with tips to make the decorating process a snap. Register at sugardoodles.org/classes or by calling Toots, 618-277-7373. Cost: $35 Breakfast with the Bunny Friday, April 19 8:00 AM - 11:00 AM Eckerts, 951 S. Green Mount Road, Belleville, IL Breakfast with the Bunny from 8am-11am for a hearty country meal to start this fun-filled day. Family-style breakfast includes scrambled eggs, hash brown, bacon, sausage, biscuits & gravy, plus a buffet of cereals, fruit and fried biscuits. Drink of coffee, juice, tea, milk or soda is included. $6.99/child and $12.99/adult. To make a reservation, please call (618)233-0513 x 3. Easter Egg-Citement Friday, April 19 9:00 AM - 3:00 PM Hop on down the bunny trail and fill your basket with fun! Eckert’s Annual Egg Hunt, baby chicks & bunnies, face painting, the Easter Bunny, plant a seed and savor a yummy Easter treat. ,A photo with the bunny can be purchased for $10 each. Easter Egg Hunts, the largest in Southwestern Illinois, will take place at 9 am, 10 am, 11 am, 12 pm, 1 pm, 2 pm and 3 pm. Register online at www.eckerts.com. Easter Worship at St. Paul United Church of Christ Sunday, April 21 9am traditional worship & 11am Celebration worship St. Paul United Church of Christ, 115 West B Street, Belleville, IL Easter morning will be filled with excitement as we worship together at St. Paul United Church of Christ. All are welcome! Free event 1818 Chophouse Easter Brunch Buffet Sunday April 21 10:00am-6:00pm 1818 Chophouse, 1405 North Green Mount Road, Suite 100 Oâ&#x20AC;&#x2122;Fallon, IL 62269 This lavish Buffet will consist of breakfast, lunch and dinner items including but not limited to; Traditional Eggs Benedict, Omelets Made to Order, Biscuits and Gravy, an Ice Bar with Oysters on the 1/2 Shell, Jumbo Shrimp Cocktail, Carved Prime Rib & Turkey, Assorted Desserts and much more! Reservations are required on this holiday, call 618-206-6451 to book yours today! $29.95 Adults, 12 + under $16.95, under 4 Free! Easter Sunday Kinderfest Sunday, April 21 10:00 am - 2:00 pm Hofbrauhaus St. Louis - Belleville, 123 St. Eugene Dr., Belleville, Il 62223 Join us for our Easter Sunday Kinderfest! Featuring Easter Brunch, Easter Bunny Photos, Egg Hunts Beginning at 2 p.m., Great Prizes, Live German Music Admission is free, however a brunch purchase is required for kids entering the egg hunts. Save My Spot Not Feeling Well? Reserve Your Spot and Skip the Wait. Your time is precious and when you aren’t feeling well, you don’t want to wait in line for an appointment. Using your smartphone, tablet or computer, you can now make an online reservation for a time of your choosing at HSHS St. Elizabeth’s UrgiCare. Our new on-target timing system will update you via texts, allowing you to arrive right before your appointment time. Visit steliz.org/savemyspot and select Reserve My Time. See current wait times. If you are experiencing life-threatening symptoms, please seek out an Emergency Room or Dial 9-1-1. You are notified via text with updates about your appointment time. Drop off your bag of shred material and we will safely and securely destroy it. See bank for a list of acceptable shred items. Simply Free Checking: Free gift may be reported on a 1099-INT or 1099-MISC. Free gift provided at the time of account opening. We reserve the right to substitute a gift of similar value. Minimum opening deposit is $50. Your cell phone provider may charge additional fees for web access or text messages for Mobile Banking. Other fees such as NSF, overdraft, dormant fee on inactive accounts, etc. may apply. See fee schedule for details. Drawing: Entries must be made at a Providence Bank banking center from 4/13/19 to 4/20/19 by 12:00 Noon CT. No account opening is required and will not increase your chances of winning. Employees and immediate family members of Providence Bank are not eligible to win. Entrants must be 18 years of age or older. One entry per person. Need not be present to win. Drawing will be held 4/22/19 at 9 am. Winners will be notified by phone or email on or before 4/25/19. The odds of winning depend on the total number of entries received. Taxes, if applicable, are the responsibility of the winners. Value of the gift card may be reportable on a 1099-MISC or 1099-INT. MEMBER UPDATES YOUNG ARTISTS TO DISPLAY THEIR WORKS AT SCHMIDT ART CENTER Get a look at some of the area’s up-and-coming artistic talent when the William and Florence Schmidt Art Center at Southwestern Illinois College’s Belleville Campus, 2500 Carlyle Ave., hosts its annual High School Student Art Exhibition and Congressional Art Competition. The exhibition kicks off Thursday, March 28 with a 6-8 p.m. opening reception. Students present artwork created in a variety of media, including paint, photography, clay, mixed media, graphite, charcoal and more. An awards ceremony will begin at 7 p.m. In addition to the SWIC awards presentation, the winners of the 12th Congressional District High School Art Competition will be announced during the evening. If you can’t make it to the opening reception, be sure to stop by The Schmidt before the exhibition closes at 4 p.m., Thursday, April 4. For more information about this exhibition or Schmidt Art Center hours, call 618-222-5ART (5278) or visit swic.edu/theschmidt. Save up to 20% oﬀ Hunter Douglas Newstyle® and Heritance® Custom Shutter Collection with TruView® Rear Tilt. Hunter Douglas NewStyle® Hybrid Shutters with Front Tilt Bar Pictured. www.stclaircc.com | 100 South 78th Street | Belleville | 618-398-3400 Restrictions Apply. Prospects must complete membership process and approval. MEMBER UPDATES LEARN HOW TO MANAGE STRESS AND GRIEF OF STROKE AT HSHS ST. ELIZABETH’S HOSPITAL, APRIL 3 To serve patients and the community, HSHS St. Elizabeth’s Hospital offers free stroke support groups for stroke survivors and their families. The next meeting will be held on Wednesday, April 3 from 2:00 to 3:00 p.m., in the St. Francis Conference Room, which is located adjacent to the hospital lobby, at 1 St. Elizabeth’s Blvd., O’Fallon, IL. The upcoming session’s topic is “how to manage the stress and grief of stroke” and will be presented by Bethany Borrenpohl, LCSW, owner and practioner of Live Well Counseling Services, LLC. “HSHS St. Elizabeth’s Stroke Support Group is excited to cover this important topic with our group members and the community,” shared Christy Koenigstein, CTRS, group facilitator and recreational therapist at St. Elizabeth’s Hospital. “Having a stroke affects so many areas of our lives whether you are a stroke survivor or caregiver. Anger, frustration, anxiety, sadness, fear are only some feelings survivors and caretakers may experience as they move through the stages of grief. This meeting will help all attending to learn to manage these feelings and continue to move forward to find joy in life again.” The overall goal of the group is to foster a better understanding of stroke recovery, rehabilitation and prevention of recurrent strokes while providing a way for stroke survivors to meet others with similar challenges. Caregivers and family members of stroke patients are also offered an open atmosphere for sharing and for supporting each other. In addition, a closed Facebook Group titled “Stroke & Recovery Support Group at HSHS St. Elizabeth’s” is also available for those affected by stroke and their caregivers. Anyone interested in joining the Facebook group, is encouraged to log into your Facebook account and search “Stroke & Recovery Support Group at HSHS St. Elizabeth’s.” Then click on the group and request to join. For additional questions or for more information about meetings, call Christy at 618-234-2120, ext. 52004 or Angela at 618-234-2120, ext. 11277. Additional meeting dates in 2019 include: June 5, August 7, October 2, and December 4. HSHS Elizabeth’s Hospital is part of the Southern Illinois Division of Hospital Sisters Health System, which also includes HSHS St. Joseph’s Hospital in Breese, HSHS Holy Family Hospital in Greenville, HSHS St. Joseph’s Hospital in Highland and HSHS St. Anthony’s Memorial Hospital in Effingham. Our hospital can now call itself one of the best hospitals in the region for 2018-2019. More than 4,500 hospitals in the U.S. were evaluated by U.S. News & World Report, and ONLY 12% achieved “Best” status. In addition, Memorial Care Center has been named one of America’s Best Nursing Homes by the publication for the eighth year in a row. THANK YOU to our caring employees; dedicated staff; and most importantly, our patients, for helping Memorial Hospital Belleville and Memorial Care Center earn these honors. MEMBER UPDATES SWIC ADULT EDUCATION TO OFFER FREE HIGH SCHOOL EQUIVALENCY CLASSES If you left high school without earning a diploma and feel that now is the time to earn one, let Southwestern Illinois College help you get ready. The Adult Education and Literacy department will offer free high school equivalency preparation classes in St. Clair, Madison and Randolph counties in March and April. Day Classes: Day high school equivalency preparation classes will meet at the following days, times and locations. Monday through Thursday from March 18 to April 24 from 9 a.m. to 12:50 p.m.: •	SWIC Belleville Campus, 2500 Carlyle Ave. •	SWIC Sam Wolf Granite City Campus, 4950 Maryville Road Monday through Wednesday from March 18 to April 17 from 9:30 a.m. to 1:20 p.m.: •	East St. Louis Community College Center, 601 James R. Thompson Blvd. •	Cahokia Library, 140 Cahokia Park Drive Monday through Wednesday from March 18 to April 17 from 9 a.m. to 12:50 p.m.: •	SWIC Red Bud Campus, 500 W. South Fourth St. Evening Classes: Evening high school equivalency preparation classes will meet Tuesdays and Thursdays from April 2 to May 23 from 5:30-8:15 p.m. at the following locations: •	SWIC Belleville Campus, 2500 Carlyle Ave. •	Collinsville High School, 201 S. Morrison Ave. •	East St. Louis Community College Center, 601 James R. Thompson Blvd. •	SWIC Sam Wolf Granite City Campus, 4950 Maryville Road Spanish Evening Classes Spanish Evening high school equivalency preparation classes will meet on Mondays from April 1 to May 13 from 5:30-8:35 p.m. at the SWIC Sam Wolf Granite City Campus, 4950 Maryville Road. A mandatory preregistration and orientation session is required. Learn more about upcoming classes and schedule a preregistration appointment by calling 618-235-2700, ext. 5525, or toll free in Illinois at 866-942-SWIC (7942), ext. 5525. We are constantly updating our community calendar. 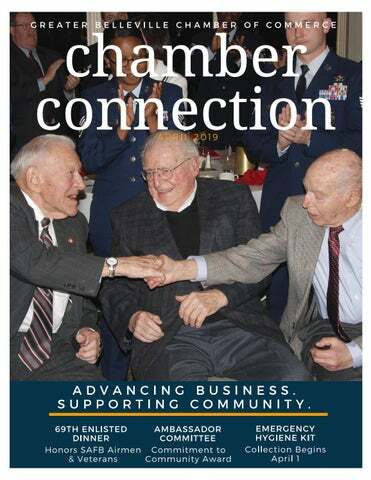 Please visit www.bellevillechamber.org for an up-to-date list of events! To submit an event, visit the calendar page at www.bellevillechamber.org or email marketing@bellevillechamber.org. Southern Illinois businesses… ... count on Greensfelder’s attorneys to protect their hard work and grow their businesses. We address the legal needs of business organizations in all sizes and industries and take the time to learn our clients’ needs and goals and help them stay on course.